Light up your lives with our stunning collection collection of illuminated pots that are perfect for use indoor or outdoors! All our pots are mains powered and come with 5 metres of cable, ready to plug in and enjoy straight away. Rechargeable Lithium Battery versions are also available. 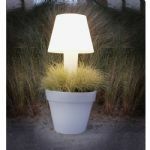 Many of our lit pots also have an LED colour changing option.